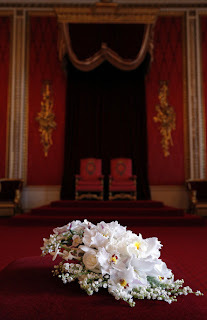 A diary of the flowers used in royal weddings, as well as some homemade floral arrangments through the year. 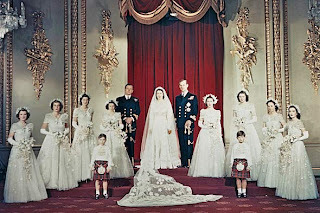 Interesting royal wedding facts and tidbits. And some useful florl design techniques and analysis of royal wedding bouquets and floral arrangements. 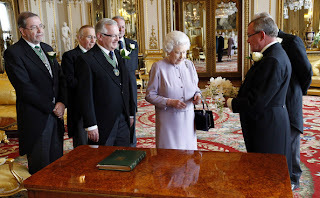 So now that I am back on the blogging thing, may as well get caught up with some recent royal happenings. Last week Great Britain celebrated the 60th anniversary of Her Majesty's coronation in Westminster Abbey on June 2nd, 1953. Another milestone for Queen Elizabeth added many celebrations and commemorations to her diary. Of course, The Queen made appearances, attended church services and met many of her subjects in what was surely a very busy week, but she is a trouper and just keeps on going no matter her age or how tiring such a schedule must be. For me, the most interesting of the Coronation anniversary observances was the recreation of the the Queen's Coronation bouquet, and the presentation of that bouquet to the Queen at Buckingham Palace. For some five years now, I have been privileged to be in contact with Mr. David Longman. Mr. Longman, now retired, headed Longmans Ltd. of London. Longmans were the florists who for many years supplied special floral arrangements for special occasions in the life of the Royal family. Martin Longman created the Queen's original coronation bouquet. 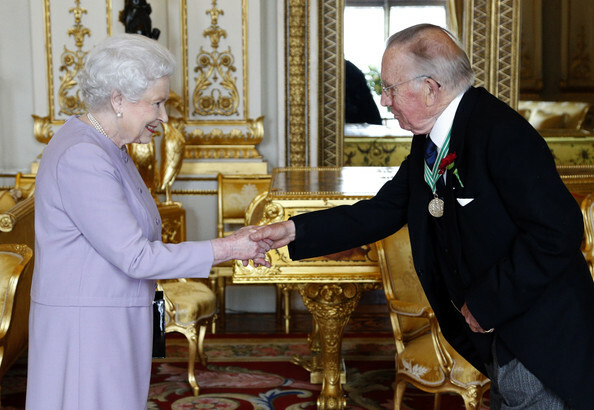 David Longman designed and oversaw the floral decorations and bridal flowers for Princess Diana, and Sarah Ferguson. 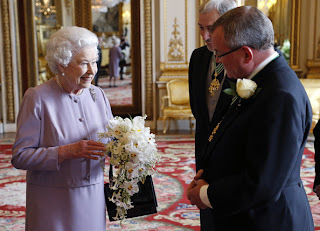 Last week marked a special gathering in the throne room at the Palace where representatives from The Worshipful Company of Gardeners presented the Queen with a near exact replica of the bouquet she carried on her coronation day. The Worshipful Company supplied the flowers for many royal occasions, teaming with Longmans Ltd. to do the actual design work in creating the finished floral arrangements. 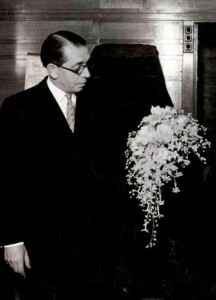 Above: Florist Martin Longman admires his work, Coronation Bouquet for Queen Elizabeth, June 2, 1953. 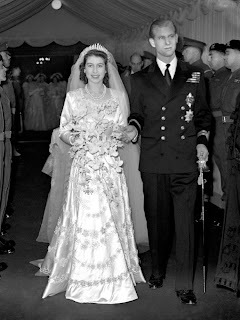 Martin Longman also designed Princess Elizabeth's bridal bouquet in November of 1947. Back in the days when I started my blog, my first goal was to talk to the person or person's responsible for making Princess Diana's bridal bouquet. My search started with The Worshipful Company who's staff was a great help in getting me in touch with David Longman. From there Mr. Longman shared with me his stories of floral work in London, and his visits to Buckingham Palace. Unfortunately, I was not able to meet David in person as our schedules were not in agreement during my visit to London... that was maybe the only disappointment of the entire journey. Even though I didn't get to meet David Longman in person, I am eternally grateful for all of the information he has shared with me over the years concerning flowers for royal weddings. 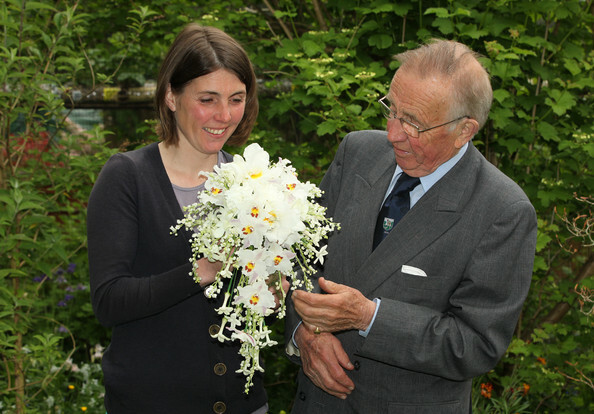 And now, just last week, David's daughter, Lottie Longman, also a floral designer, had the unique opportunity to recreate the coronation bouquet, a replica that would be presented to Her Majesty to commemorate the anniversary. 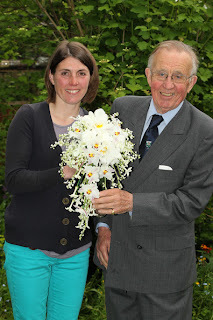 Following are some photos of Lottie and her father, David, as Lottie recreated the bouquet consisting of orchids, roses, and Lily of the Valley. Job well done to all of the Longman family, congratulations as well on their more than 60 year long relationship with the Royal family. Following are photos from Zimbio.com, shown are Lottie Longman and her father David Longman... along with her stunningly accurate recreation of the coronation bouquet. 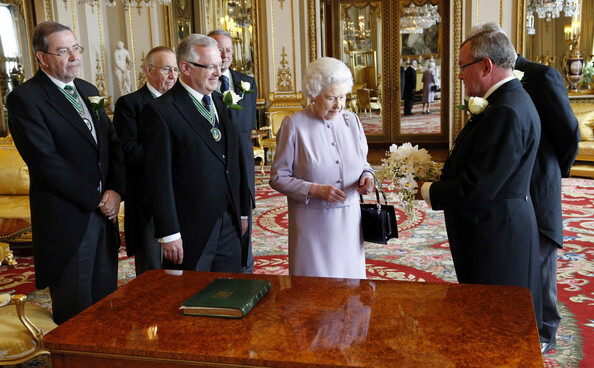 Other photos show the very lucky David Longman meeting with the Queen in the throne room along with members of TWCG during the presentation of the bouquet. Congratulations to Lottie Longman for her expert work in recreating the Queen's coronation bouquet. Lottie is certainly a very talented floral designer! 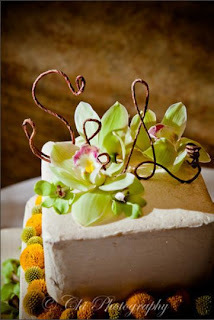 Royal Flower tidbit- of the day... Even as recently as 2011, the process for making royal bridal bouquets has incorporated the traditional method of wiring and taping each individual blossom, and sometimes each leaf, separately so that the flowers can be manipulated into the desired placement for the bouquet's shape. 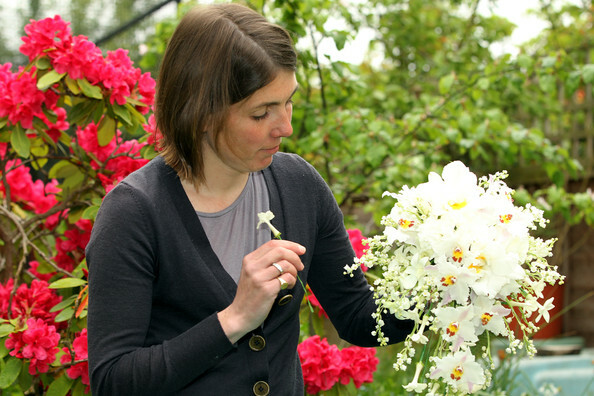 This is a very daunting task considering how many individual blooms may be contained in just one royal bouquet. I myself us the process whenever possible, but it does present some challenges. For instance, since each flower is cut from it's stem before wiring/taping, water supply is cut off to the flower, starting the inevitable "death of the flower" process. Therefore, these bouquets have to be made as "last minute" as possible to ensure they will last through the wedding day schedule. This design process takes much patience, practice and skill. 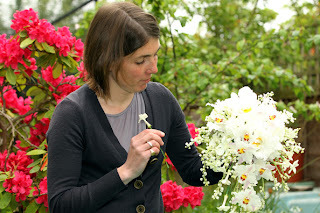 As a rule I make all of my cascade bridal bouquets using this traditional method. In royal wedding scenarios these days, multiple and identical bouquets are made to avert and mishaps... such as a lost bouquet.... which actually happened to the Queen on her wedding day. Notice in her formal wedding photo below, she is carrying no bouquet... somehow, someone misplaced the bouquet during the wedding breakfast, so the bouquet was a no-show for the photos! 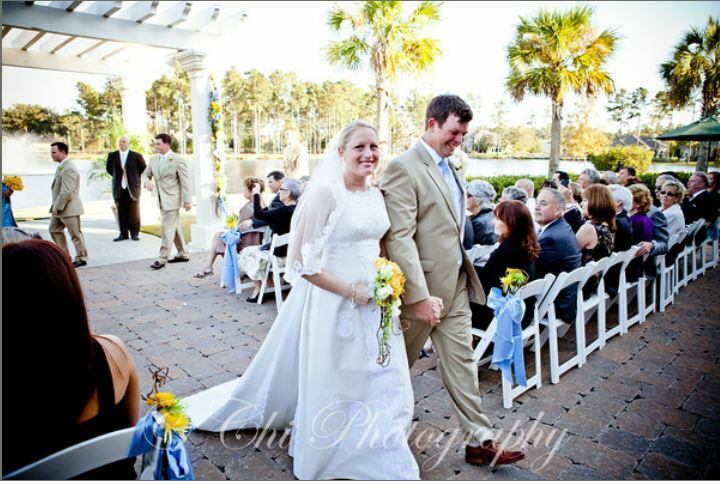 Finally, here is an example of my own "wire and tape" work... a bridal bouquet I made for an October 2011 wedding in South Carolina... Thank you to Chi Photography of Charleston for the photo. Yes, we went to Paris, and London! See the previous post of some sites in London and a description of our journeys through England's busiest city. And more information on our 2012 vacation in up-coming posts. Hello Flowers for Royal Wedding followers! Yes, it's been way too long since the last post... I believe over two years.... is that a record? ... do I win a prize? Next Question, do you recognize the scene above? If you don't, then you weren't watching closely to the royal wedding coverage in April of 2011. Since my last blog post, we, that is my partner and I have traveled to London and Paris. Definitely the trip of a lifetime, and we got to see all that we wanted to see in both beautiful cities. Side trips included Windsor Castle and Versailles. If you haven't been yet, do yourself a favor and go soon. Our tour was guided, somewhat. We made sure to pic a touring company that left plenty of free time on the schedule so that we could insert our own walking tours. Besides evening strolls on the Seine, sumptuous French cuisine, dazzling crown jewels and ancient castles and the grandest of cathedrals, Notre Dame de Paris, the most amazing part of the trip was the evening at Buckingham Palace. Please, if you go to London, do not pass up any change to take the tour of the palace. My eternal gratitude to Stan for finding the special evening booking, and making all of the arrangements for our palace tour. You really haven't lived until you have experienced the Queen's London home on a tour in the evening, with only 20 other guests and conclude with champagne and punch on the Bow Room terrace. They really treated us like Kings/Queens. Just so happened even more luck was had in that we visited the palace during the Diamond Jubilee year. Most amazing inside the palace tour was the special exhibit of the Queen's personal diamond collection... including... wait for it, yes! 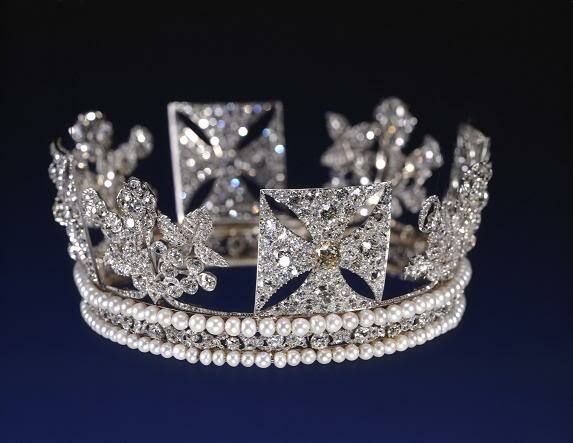 my favorite of all the Queen's headpieces, the George IV Diadem or, as I learned it is also referred to as the Hanoverian Tiara. We were as up close and as personal as I could get with out leaving nose smudges on the glass cases. It was a dream come true. As this weren't enough to stop the heart of this royal wedding enthusiast, we went on to see, the next day, all of the crown jewels in the Tower of London. Take my advice and visit London just as the summer season is ending and the lines will not be so long. Viewing the coronation pieces were entrancing... we took four turns on the conveyor belt and waited several turns to get up close to the case containing the Imperial State Crown.... all very much worth the wait. London also had us visit Kensington Palace, Windsor Castle, St. Paul's Cathedral (I had to do my Diana Walk to the Altar!) St. Ethedrada's, Spencer House, and of course the Abbey. I could go on and on about each minute and hour of our journey, but I'll save more for later. Thank you to my best friend and partner, Stan, for planning and executing this vacation of a lifetime! And thanks to my best sister-in-law, Colleen, for urging me to get back to blogging. Royal Wedding Tid-Bit of the day.... What about the button-hole? In Britain, they call it a Button-Hole, not a boutonniere... that little flower or floral cluster that traditionally is worn by the groom and groom's men, on the lapels of their jackets. But, in most royal weddings, the groom and the best man are often in military uniform, thus, negating the use of a boutonniere or button-hole. Prince Philip, wearing his Royal Navy uniform when he married Princess Elizabeth in 1947, of course wore no flower on his lapel.... no room for one with all those medals and insignias. By the way, best wishes for a speedy recovery to HRH Prince Philip. 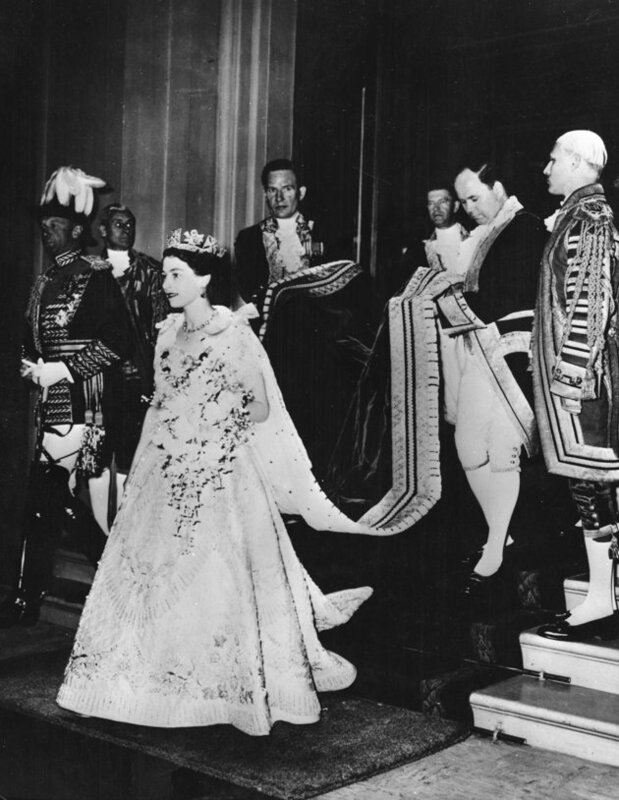 Monday, February 6th marked the 60th anniversary of Queen Elizabeth II's ascension to the throne. Only Queen Victoria has reigned longer, and the current monarch has three more years to reign before surpassing Victoria's record reign. Elizabeth II became ascended to the throne of Great Britain on February 6, 1952, upon the death of her father, King George VI. The queen's coronation ceremony however, followed more than a year later in June of 1953. Why the delay? Well, one reason was to accommodate a respectful period of national mourning for the late king. 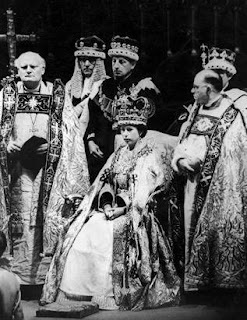 Secondly, to accommodate the massive operation of organizing a regal coronation on a scale never seen before... as for the first time, television cameras were placed in Westminster Abbey to record all but the most solemn moments in the coronation ceremony... the annointing and communion portions were the only parts of the ceremony not seen by the camera. Queen Elizabeth has carried some amazing bouquets in her lifetime. 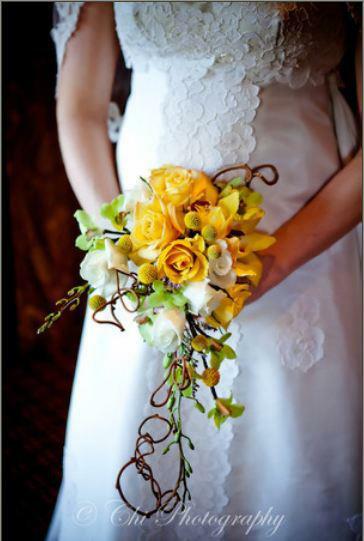 The coronation bouquet seen above was created by London florist, Longman's of London, Ludhill Gate. The arrangement for coronation day consisted of Lily of the Valley, Stephanotis, and white Cattleya orchids. David Longman was responsible for this bouquet, his father Martin was responsible for the design of her bridal bouquet, while still Princess Elizabeth, on her marriage to Prince Phillip in 1947. Royal Tid-bit of the day... During her coronation, the Queen wore several headpieces... on the way to the Abbey she wore the George IV diadem, on the return to the Palace she wore the Imperial State Crown... for the actual moment of crowning... St. Stephen's Crown, shown below. 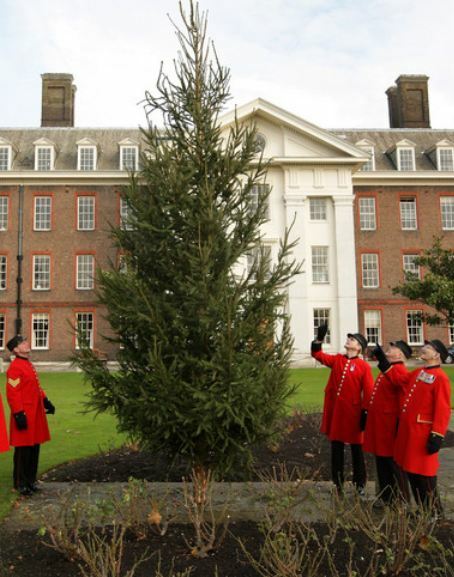 It's just a few more days 'til Christmas, and our perfect tree has been decorated for a few weeks now. 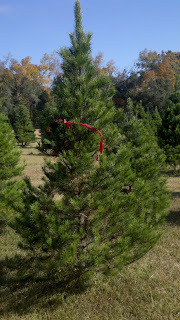 The search started in late November when I ventured to a local tree farm in Okatie, SC. 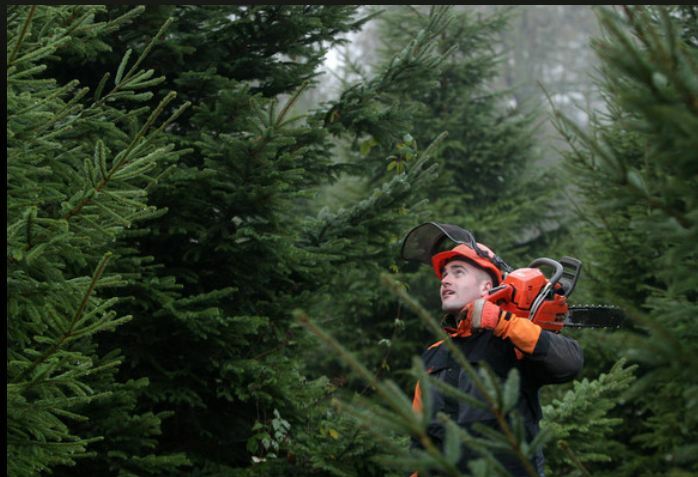 You have a choice there of Leland Cypress, Red Cedar, or Virginia Pine. 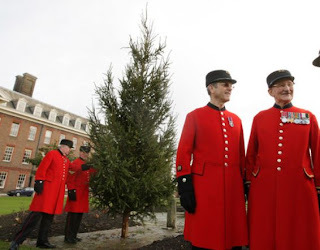 We find that the Va. pine is a good fit for us because they look like old fashioned Christmas trees, and because they look best with our vintage lights and vintage glass ornaments. Since there is a definite lull in royal wedding activities and in my own wedding business this time of year... thought I would post some pics of our Christmas tree... showing that everyone has a different definition of the perfect Christmas tree. 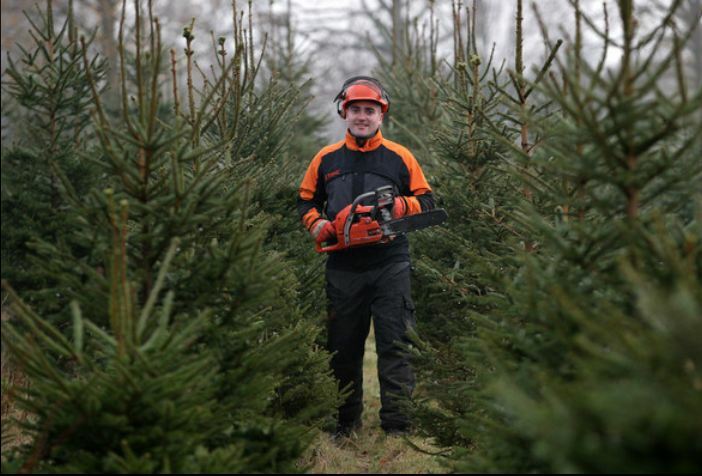 So, Merry Christmas and Happy New Year! Terry. We really go for the Shiney Brite vintage look on our tree with tinsel garland, bead garland, and the finishing touch of real lead icicles. The lights are all C7 ceramic and bubble lights, makes it warm and nostalgic in our living room. And, for the first week or so, the tree gives off this very powerful pine scent... not so much after a couple of weeks have passed. 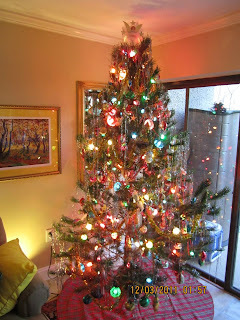 Enjoy the pics of our perfect Christmas tree for 2011. Royal tid bit of the day... Christmas trees used at London's Chelsea Hospital are donated by HM The Queen. 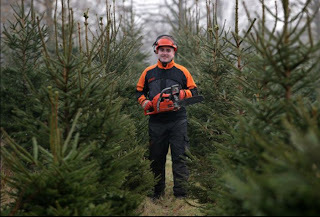 The trees are cut from the forests surrounding Windsor Castle. During the lull in Royal Weddings, I was out creating a little wedding magic of my own. September and October were very busy wedding months for me flower-wise, but, none of the weddings I participated in embraced the traditional Autumn floral themes so popular during these months. Instead, hot pinks, purples, yellows, pale blues, and shades of green were the order of the day. One wedding specifically requested a Sunset Color theme, close to Autumn with oranges and coral tones, but incorporating purples, blues and lavender. They all turned out beautifully... so here is a little photo sampling of the past few months... enjoy! 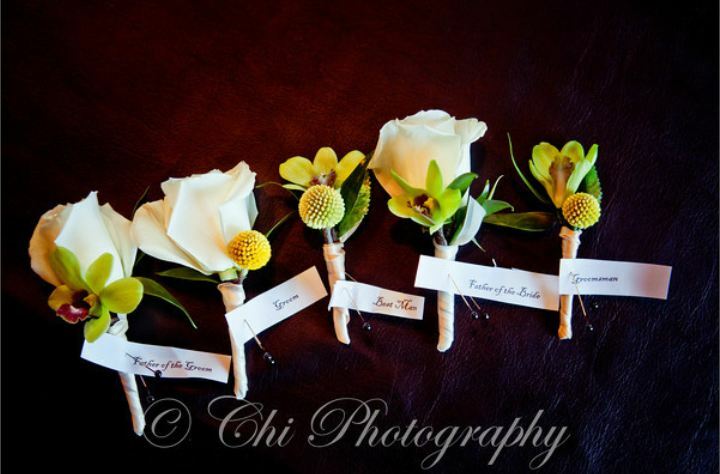 Congratulations to all of these brides and grooms, it was a pleasure serving their floral needs for their very special occasions. 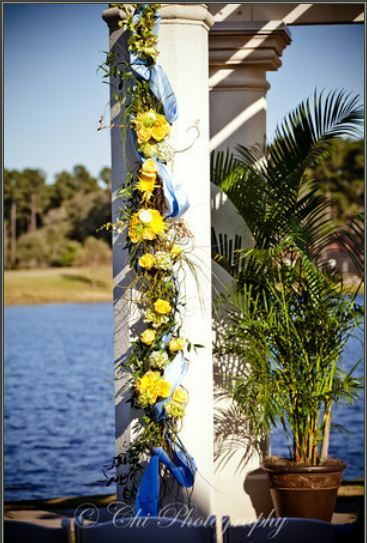 And super extra thanks for my best flower-friend.. Lauri Leber, owner of Flower Shop Bluffton, for he invaluable assistance in the execution of these lovely events. 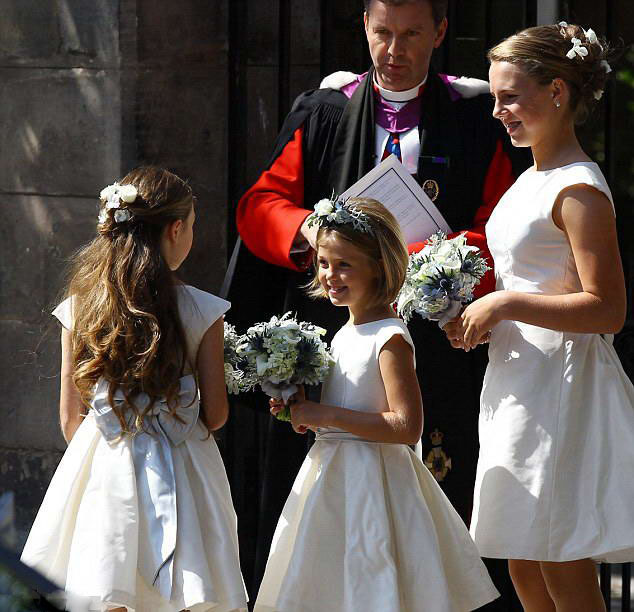 The eldest granddaughter of Queen Elizabeth has finally gotten her day to shine as a royal bride. This wedding that took place in Edinburgh on July 30th, was in total contrast to the wedding we saw take place in London in April of this year. Zara Phillips, daughter of The Princess Royal, Anne married footballer Mike Tindal at Canongate Kirk... the royal place of worship located close by Hollyroode Palace. Hollyroode Palace, or "house" as it is also called, is the official residence of Queen Elizabeth when she travels to Scotland's capitol. 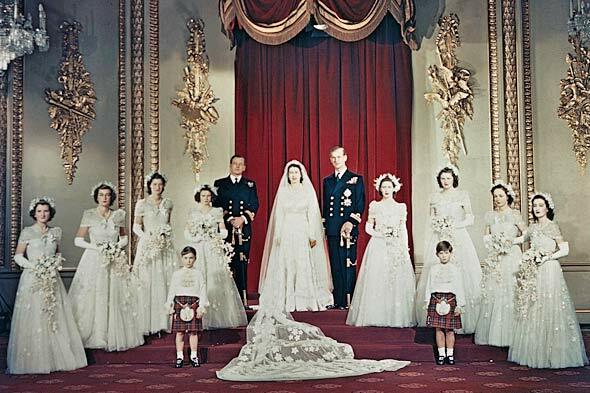 This royal wedding was quite subdued, and photographers and t.v. cameras were not allowed inside the church. However, there are plenty of pictures of the lovely bride and her beautiful flowers. 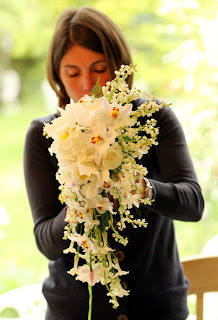 Zara chose a rather rustic hand-tied bouquet of miniature white calla lilies, Lily of the Valley, Echinops Thistle, Dusty Miller foliage... all based with white hydrangea. I think the combination of simple tones in white and grey is wonderful to compliment her ivory gown and the more informal setting. But, the most dynamic aspect of the flowers are the many varying textures among the flowers and foliage. Most appreciated is the use of Echinops Thistle... as a nod to one of the national emblems of Scotland. I think we are seeing a trend starting... having one's bridesmaids attired like the bride and carrying identical but smaller versions of the bridal bouquet. Also, it appears that a more mature bridesmaid has been included to perhaps corral the younger members of the wedding party. This blogger loves Zara's bouquet, and really appreciates the family traditions among the royals... as Zara is wearing a tiara on loan from her mother, Anne. Well done Zara and Mike! Three of the bridesmaids.... all in ivory, one with the palest blue bow on her dress, each one wearing flowers in their hair, arranged accordingly to suit the style of their individual hair styles. Royal Wedding Tidbit for the day.... 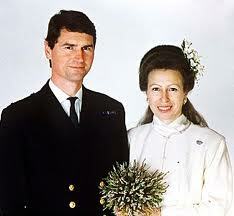 The last royal wedding to take place in Scotland was the wedding of Princess Anne, when she married her second husband, Timothy Laurence. Then as well, a floral nod was made to Scotland as her bouquet was a nosegay composed entirely of heather. A floral designer with more than 15 years experience in creating elegant and original floral themes for weddings and parties of any size, specializing in traditional design techniques to create modern sand stylish floral decorations.